For my final paper I am thinking of examining the future of children’s books and ebooks. When I was a preschool teacher we had paper and board books, audiobooks (some of which had follow along picture books) and two iPads within the classroom. The students interacted with each object differently. They would sit and read or look at the pictures in the picture and board books, listen to the audio books and look at the accompanying picture books and play games on the iPad. In an ever digitizing world full of busy parents, young children are being continuously exposed to and becoming increasingly proficient in using smart phones and iPads. Many of the students in the class were more experienced in using iPads then both teachers. At one point a student downloaded angry birds and neither teacher could figure out how to fix it and had to ask the student to do so. Children as young as two and a half using advanced technology is becoming common place. As children’s books have often been an area full of creativity and experimenting with formats it makes sense that we will see new and innovative ebooks being created for children. In my paper I will try to uncover the possibilities available to creating ebooks for children and the manner in which they will help to develop children cognitively. 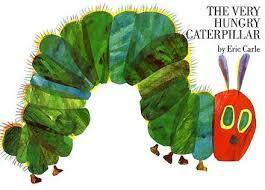 Take The Hungry Caterpillar for example what was available originally as a paper book and board book can be found online in a pdf slideshow, youtube of people reading the book and audiobooks. Though it is not yet available as an ebook, with questions and challenges for counting, identifying color and fruits and vegetables and sorting this ebook has the potential to do a lot for the cognitive development of children.